East End Park: Sometime in the early 1900's, several of the East Ellsworth business people got together and built a dance pavilion in the East End Park, known as the Park Pavilion. It was built on pillars because of the danger of floods in the park. The pavilion flourished until 1919, when the Fair Ground Pavilion was built. A pillar from the old pavilion still stands in the East End Park today. In 1922, the Ox-Bow Inn was officially opened and the tourist kitchen was built of logs near the Park Pavilion. Ox-Bow Inn still stands today and is used for various festival activities. The park is located on Hwy 10 and East Wall Street, close to the East Ellsworth business district. Picnic tables, shelters, grills, drinking fountain, benches, restroom facility, and basketball hoop and playground equipment are available at the site. The park serves as the headquarters of the annual Cheese Curd Festival. Summit Hill Park: Summit Hill Park, a lush green expanse of 16 acres, is located in the residential area, midway between East and West Ellsworth. Access is made on West Grove Street or West Summit Avenue, where parking is available. The beautiful park is the home of the Ellsworth Hubbers Baseball team at Bob Young field. The park is used by families who spend leisure time at the picnic shelter and picnic tables. The park also offers grills, drinking fountain, playground equipment, tennis and volleyball courts, a softball field, tennis courts and plenty of park benches. The baseball field has a concession stand and restroom facility. Cairns Woods Park: Cairns Woods is a beautiful woodland area located on North Cairns street, just off Highway 65 North. Through the generosity of Gertrude Cairns, and in tribute to her parents, Mr. and Mrs. George Cairns, the 34 acres of land was purchased by the Village of Ellsworth in 1949 to be used as an education demonstration forest. It has groomed and non-groomed trails for exploring or spending quality family time together. Spring and fall are especially beautiful at Cairns Woods Park, with spring wildflowers and stunning red, gold and orange autumn color thanks to the many basswood, red oak, elm and hard maple. Pierce County Fairgrounds: Located on the North side of Ellsworth, the fairgrounds are perfect for walking, biking or skating when not in use by numerous county and local events and festivals. Enter on Grove Street or Highway 65. For more information visit their website here. Trimbelle Recreation Area: A local gem, this recreation area is located approximately 5 miles west of Ellsworth on County Road O just 1/2 mile south of US Highway 10. 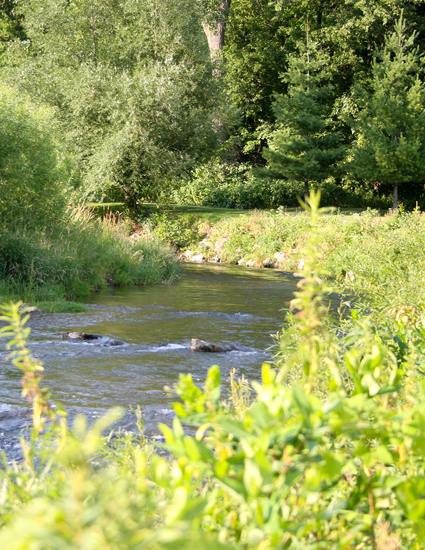 The main feature of this property is access to all for trout fishing opportunities along the Trimbelle River. No fees are required to enjoy this property. Visitors can experience a .25 mile long paved hiking trail loop that has 4 trail spurs to access the Trimbelle River. There are four small picnic shelters available. The property is open to visitors from sunrise to sunset. Other amenities include a spacious parking lot, disabled fishing access to the Trimbelle River, trout habitat structures, 4 small shelters with picnic tables, on 32 acres of river frontage & forest. The majority of this property is river bottom with over 750 feet of river frontage. For more information visit the Pierce County Parks website here. Nugget Lake County Park: Nugget Lake County Park features a full-service campground, open year-round. The park is located south of Ellsworth at N4351 County Road HH in Plum City. Located in Rock Elm & Union Townships, this 752-acre park, established in 1974, is the flagship of the Pierce County Parks Department. The main feature of the park is Nugget Lake. The 116-acre lake is nearly two miles long and is entirely surrounded by forested property managed by the county. The lake's primary feature is fishing, but its scenic beauty also draws a large number of outdoor enthusiasts. Approximately 25% of the parkland is developed for outdoor recreational activities. The main outdoor recreational activity is camping. The park provides a 55-site modern campground complete with electrical sites and comfort station. The campground also has several other amenities that include swing sets, a playground and camping cabins. The park also provides environmental educational programs; nature movies are shown at an outdoor amphitheater every weekend between Memorial Day and Labor Day. Camper and various small groups participate in the nature programs that are conducted on a weekly basis. The park also has over six miles of maintained hiking/ski trails located throughout a variety of natural resource systems. The backdrop for the trail system is the Rock Elm Creek and Plum Creek. The meandering creeks converge in the center of the trail system and continue on as Plum Creek. Located throughout the trail system are various sites that contain interpretive and educational information. Several scenic overlooks and rest areas are also located throughout the trail system. For more information, visit their website here. Lee-Kay Family Educational County Forest: The educational forest is located approximately 3 miles west of Spring Valley on State Highway 29. The property is open to visitors from sunrise to sunset and no fees are required to enjoy this property. Experience a .6 mile long self-guided hiking trail loop that has over 15 individual tree identification and interpretation markers, with the most abundant trees being oak, maple and basswood. The trail can be utilized in the winter for cross country skiing and snowshoeing. The parking lot will accommodate buses. For more information, visit their website here.